Kicking the habit: How is Bali coping with no plastic bags? Almost one month into a ban on single use plastic bags, Styrofoam and plastic straws and Bali isn't showing any signs of having a relapse. A similar ban on plastic bags prevented an estimated 1.5 billion bags being introduced into the environment. Denpasar's Ogoh-Ogoh parades will be plastic and Styrofoam free in 2019 according to Denpasar Disbud. Bali's capital of Denpasar officially banned single use plastic bags in supermarkets, convenience stores and shopping centres on January 1. And less than 4-weeks later the movement is gaining momentum; at least that's the buzz. Within a week, the initiative was apparently being supported in the neighbouring regency of Tabanan, who have yet to be officially asked to participate in the programme, according to the Seminyak Times. Coconuts Bali is reporting an island wide ban is expected to come into effect in June. Much of the credit has to go to Melati and Isabel Wijsen, the sisters responsible for the Bye-Bye Plastic Bag campaign in Bali, which gained much attention after former Governor Pastika signed a Memorandum of Understanding banning plastic bags back in 2014. This did not gain traction as many hoped it would but things seem to be different now and global awareness has reached new peaks and the Bye Bye Plastic Bag Movement is now active in 18 countries. The sisters were recently recognised by CNN as one of the world’s Young Wonders as part of the CNN Heroes event, giving the island and their movement enormous exposure. Local News Wires are reporting the ban has the strong support of the Indonesian Retail Business Association or Aprindo Bali. The Chair of which, Anak Agung Ngurah Agung Agraputra said during an audience with Deputy Mayor of Denpasar recently, that the organization strongly supported the policy. "Around 97% of our members no longer provide plastic bags for consumers," he said and that in itself is having some interesting knock-on effects. According to Agraputra, the policy to reduce the use of plastic bags is not only to safeguard the environment, but it also has positive benefits for retail entrepreneurs who now no longer need to budget to buy plastic bags, thereby saving considerable amounts of money. It remains to be seen if there are any plans to pass these savings on to customers. The Deputy Mayor of Denpasar, IGN Jaya Negara, said Aprindo Bali’s support was very much appreciated, going on to tell local press that as one of the world's most popular tourist destination, Bali's role in this global environmental movement was an important one. He asked for everyone to work together to reduce the use of plastic bags, plastic straws and Styrofoam and to continue to be innovative to make this positive step a success. "It is our hope that all levels of society will be able to provide smart ideas as a substitute for plastic bags," he said as it would also increase creativity that will have an impact on the creative economy, something the new administration seems very keen on promoting. One of Bali's most famously creative activities are the Ogoh-Ogoh parades held on the evening before the Balinese New Year and Day of Silence, called Nyepi. The parades are scheduled to be held on March 6 this year. Traditionally these demonic effigies of evil spirits, some measuring many metres high, have been constructed from bamboo and paper but in recent years these traditional materials have been replaced with Styrofoam. 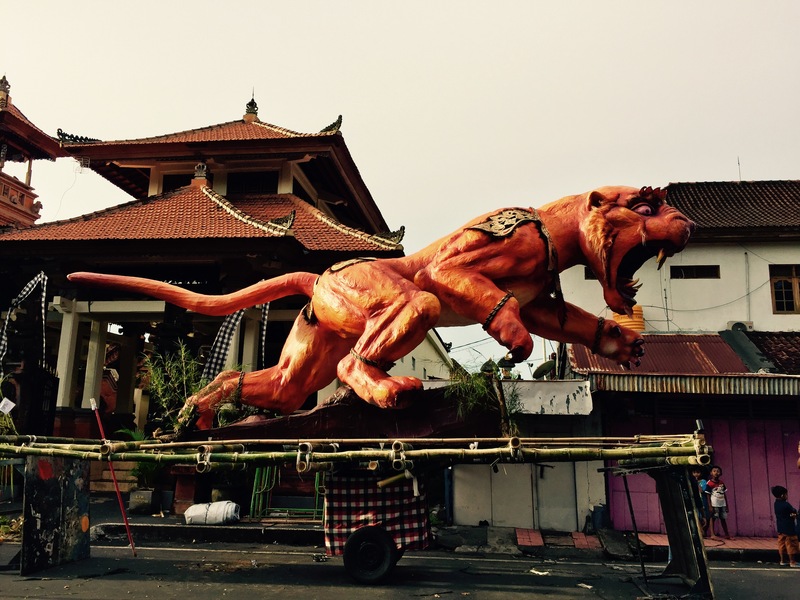 Effigies as tall as houses parade the streets on the eve of Bali's New Year in March. Head of Denpasar Disbud, the provincial cultural department, I Gusti Ngurah Bagus Mataram, has said this year's official Ogog-Ogoh parades will also ban the use of plastics and Styrofoam as a way to support the governor's initiative, and only bamboo, paper and natural products will be allowed, he told Nusa Bali. In neighbouring Australia a similar ban on plastic bags prevented an estimated 1.5 billion bags being introduced into the environment according to The Guardian UK in December 2018. Coles and Woolworths’ decided to stop offering single-use disposable plastic bags midway through the year and three months on the change has translated to an 80% drop in the consumption of plastic bags nationwide, according to the National Retail Association. A recent report in Reuters claims that between 500 billion and 1 trillion plastic bags are used annually around the world. Less than 10% of this is recycled and much of the rest ends up in the oceans. The UN Environment Program estimates some 8 million tonnes of plastic is dumped into the oceans every year and over 60% of this is generated by China, Indonesia, the Philippines, Vietnam and Thailand. Bogor in West Java, introduced a similar ban on single use plastic bags on December 1 2018, and local News Wires are reporting the country's capital Jakarta could be next on the list. And that could be a game changer.